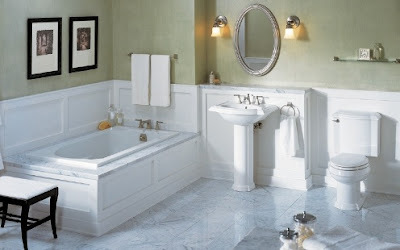 The bathroom is perhaps the most heavily trafficked room in any home – it needs to be able to stand up to a lot of wear and tear so bath and shower hardware should be top quality. When you add in the elements of moisture and humidity, surfaces can get slippery and hardware can easily corrode so it’s best to go with brass hardware, which can be chrome or nickel-plated. Even the shower curtain rings or hooks are best made of a good quality plated metal so they slide easily which results in less wear on the shower curtain itself. It can be tempting to go with plastic in a bathroom and for items such as bath toys or shower caddies plastic is fine. For items such as a toilet tissue holder which will see regular use it can be a good idea to spend a little bit more for something substantial; the same holds true for towel bars and rings. Anything you are likely to pull on or hang things from should be sturdy and of good quality; it is even possible to replace the plastic flush handle on your toilet with a metal one which both looks and feels better when you handle it. Bathroom clutter poses a slip and fall hazard so where possible, floor and counter surfaces should be kept clear. Install wall mounted soap, shampoo and conditioner dispenser inside the shower or tub enclosure; install a toothpaste dispenser to eliminate waste and reduce messy spills. A wall mounted lighted magnifying mirror can be helpful for grooming and more useful than a handheld or counter top mirror; consider installing a fogless shower mirror as well.